Are your adolescent English language learners struggling to read, write, and learn across subject areas? Are they making it to graduation? This practical guide is grounded in the latest research on adolescent literacy development. It features effective strategies for content teachers, ESL teachers, and guidance counselors to ensure that middle and high school English language learners can engage with complex grade-level content-area instruction, develop oral and written language for academic purposes, and graduate. 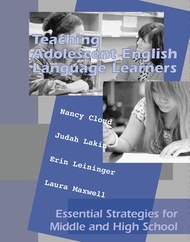 It is written by exemplary secondary school teachers who know firsthand the challenges of educating adolescent ELLs, and who have implemented these strategies effectively in their classes. As Deborah Short highlights in the foreword, this book also offers much more than teaching strategies. It is about the social dimension of learning in secondary schools; of shaping one’s identity; and of bridging the boundaries between school and home, school and work, native languages and English, and in-school and out-of-school literacies.